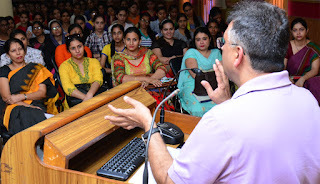 Chandigarh 21st September:- Management Institute for Leadership and Excellence (MILE) organized Mavens Speak Workshop "Get the best out of Life" in collaboration with Department of Economics of MCM DAV College for Women, Chandigarh. Nitish Bhushan, Regional Business Head, North India, at CMS IT Services had an interesting interactive session with the students. He talked on the important topics of management to provide an insight with respect to career management and the balance between the work life and the personal life. The talk was highly inspirational and motivational as students learnt the life lessons by such a high positioned corporate leader.